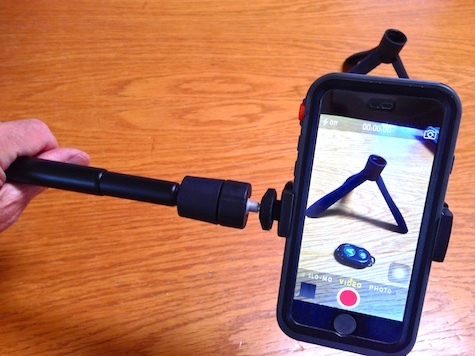 I nominate iKlip Grip from IK Multimedia for Most Innovative and Versatile iPhone/iPod Accessory of 2015. iKlip Grip is four products in one package at a reasonable price: table top tripod, selfie stick, extension handle, and tripod adapter, in order of probable usage. As a bonus, a Bluetooth remote control shutter release is provided. 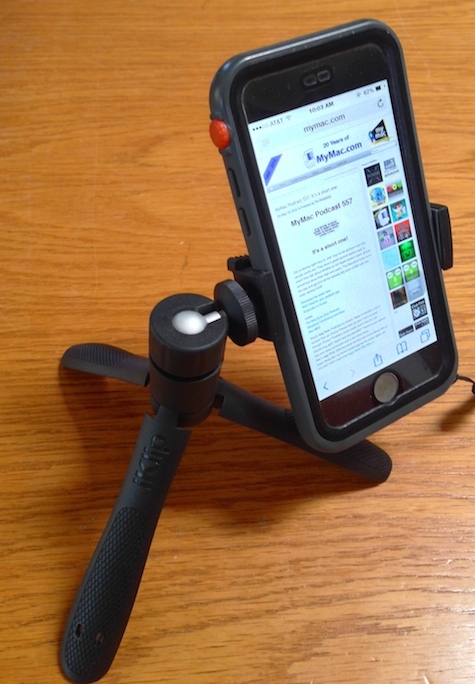 The single best feature of iKlip Grip is its most basic, but not immediately obvious, ability to position your iPhone in front of you in stable vertical/portrait orientation. There are hundreds of stands and cases for horizontal/landscape viewing, but very few to none that work in portrait mode. iKlip Grip does both beautifully. This product is designed and manufactured in Italy for international customers. The included printed manual is fifteen pages of illustrations and symbols that are perplexing if you have never worked with similar instructions that lack descriptive text. Once you figure out what’s what with the directions, position your iPhone, iPod, camera, or other small portable device in the sturdy, spring-loaded expandable spring-loaded soft-touch rubber bracket clamp on iKlip Grip’s folding tripod for Skype/Face Time video conversations, selfies, game play, reading, music videos, guitar practice, and a zillion other purposes. When you need stability for making hand held photos or videos, squeeze together the tripod’s legs and hold your device by the light weight ergonomic handle that is formed. Remove your device from the tripod+handle, attach it to the telescoping detachable tube, and expand the tube as desired for group selfies, concert videos, wildlife photos, and countless other extension uses. The company’s dedicated web site for iKlip Grip has helpful photos and specifications for everything described above. Be careful when attempting to use iKlip Grip’s tripod stand with the long tube fully extended because it’s top heavy. You don’t want your iPhone to fall and crash. Instead, use an actual tripod for support, as illustrated on the last page of the little printed instruction booklet. There’s more! The Bluetooth remote shutter is the size of a chubby adult thumb. To make sure you don’t lose this little wonder, a helpful attachment lanyard is included with loops to secure it to the shutter and the tripod stand. Bluetooth pairing is immediate and shutter release in instantaneous. Well done, IK Multimedia. There is huge value with a multitude of uses for this combo product. Highest recommendation.